We are able to manufacture and supply high quality R CLIP. We offer these pins in many sizes for the needs of our customers. Our team of experienced professionals manufacture these pins in our huge infrastructure facility by making use of supreme grade steel. The steel is obtained from the most reliable and trusted vendors of the market. The R CLIP which we offer is widely demanded by our customers as these are non-corrosive and very durable. 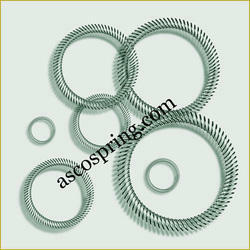 Compression Spring can be used as extension spring if assembled with wire forms called drawbars. Uses for this type of spring can vary, however drawbar extension spring are most commonly used when there is excessive deflection of a normal extension spring and breakage occurs. Drawbar spring are designed at safe stress levels at the compression spring solid height. One of the key features of the drawbar spring is that the springs are designed in such a way that the drawbars prevent buckling as they are being compressed. In addition, the drawbar spring has a hard stop at the compression spring solid height which makes it the optimal choice in applications where overload protection is necessary. Garter Springs are helical compression or extensionsprings whose ends are connected so that each spring becomes a circle and exerts radial forces. Their primary application is in oil seals. Other uses include small motor belts, electrical connectors and piston-ring expanders. Asco Design methods for garter springs are continuations of methods developed for helical compression and extension springs. Generally, garter springs are designed with as low a rate as possible to provide a nearly constant force on a seal as it wears. The garter is essentially a helical tension formed into a circular ring with the ends connected on the inside diameter. Thus a garter spring is an endless spring, ignoring that its ends are joined which does not affect the results. A garter spring is easily identified in that it looks like a circle made up of a spring. Looking for Special Springs ?